On 11 September 2001 (9/11), some 17 years ago, four hijackings of US commercial planes by al-Qaida terrorists led to almost 3,000 deaths and over 6,000 injuries, and profoundly changed our sense of security. Those hijackings resulted in the destruction of the World Trade Center towers, massive damage to the US Pentagon, and a plane crash in rural Pennsylvania. The terrorists had intended the last plane to crash into the US Capitol or the White House. That intention failed when the plane plummeted from the sky due to passengers overwhelming the terrorists in the cockpit after learning of the other three crashes from cell phone calls. As a stunned nation watched the 24/7 news coverage of the events of 9/11, members of President Bush’s cabinet, some world leaders, and the news media tried to identify a simple root cause in order to identify subsequent action to limit future terrorist attacks. On 22 March 2002, President Bush said in a speech in Monterrey, Mexico, that “we fight against poverty because hope is the answer to terror.” In response, President Bush redirected some US aid to help fight the war on terror. Despite his speech and wish to alleviate world poverty, much of the increased aid went to bolster recipient countries’ offensives against resident terrorist groups that presented terrorism risks to the United States. The US aid did not really reduce poverty in the recipient countries to eliminate an alleged root cause of terrorism. There is an irony about using tied foreign aid to fight terrorism on behalf of the United States or other Western donor countries. Some scholars asserted that foreign policy positions of Western countries (e.g., support of unpopular leaders or the imposition of Western liberal-based policies) sparked terrorism. If that is true, then US-tied aid can be a stimulus, rather than an inhibitor, of such terrorist attacks on US interests at home and abroad. Aid-recipient regimes may be viewed by their citizens as US puppets, thereby enraging citizens to engage in terrorist attacks to voice their displeasure. That reaction suits the resident terrorists. Additionally, grievances subsequently may follow if the aid skews the income distribution more in favor of the ruling class. The alleged linkage between poverty and terrorism generated extensive academic research on this relationship. The well-being of a country’s citizens generally is measured by income per capita or the average income earnings of its citizens, which is total gross domestic product divided by population. Low income per capita is equated to poverty because the typical person has little to live on. When researchers explored the relationship between terrorist attacks and income per capita, their findings were inconclusive. That was true for domestic and transnational terrorism. 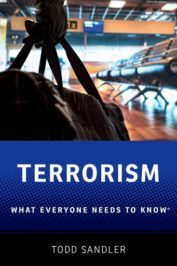 Unlike transnational terrorism, domestic terrorism involves perpetrators and victims from just the host country of the attack. Some articles found that more terrorist attacks took place in countries with greater income per capita, so that richer countries experienced more, rather than fewer, attacks than poorer countries. Relatively few studies uncovered the hypothesized low income per capita or poverty linkage with more terrorist attacks, consistent with the views of President Bush, media commentators, and others. Some articles found no relationship between income per capita and terrorism. The well-being of a country’s citizens generally is measured by income per capita or the average income earnings of its citizens, which is total gross domestic product divided by population. A recent study by Walter Enders, Gary Hoover, and Todd Sandler indicated that poor and rich countries experienced the least terrorism. In their global sample of countries, middle-income countries suffered the most domestic and transnational terrorist attacks. The storyline behind those results is that people in really poor countries are more concerned with their subsistence and surviving another day. Thus, they possess little means or interests in partaking in risky and time-consuming terrorist campaigns even when they harbor grievances. By contrast, citizens in rich countries generally have few grievances that may erupt in terrorism. Moreover, rich countries possess the manpower and hardware to crush domestic terrorist groups or to project their might abroad to annihilate foreign-based terrorist groups. A good example of power projection is the deployment of US drone attacks in Iraq, Pakistan, Syria, and Yemen. In middle-income countries, terrorist groups can attract operatives to conduct terrorist attacks at home and abroad to air grievances and to issue political demands. Middle-income countries have less capability than rich countries to confront terrorist threats at home or on foreign soil. Thus, unlike conventional wisdom, terrorism is not caused by poverty per se. Other simple root causes – e.g., globalization (increased cross-border exchanges) or increased immigration – also have been dismissed by researchers. Post-9/11 research showed that root causes differed by terrorist campaign, with no single genesis or easy fix for terrorism in general. Causes can include foreign policy disagreements, economic discrimination, regime change, religion-based grievances, and others. When the next large-scale terrorist attack occurs in the West, simple root causes again will be offered by political leaders and the media even though evidence does not support such assertions. Featured image credit: Hanging Industry Stock by igorovsyannykov. CC0 via Pixabay. Todd Sandler is the Vibhooti Shukla Professor of Economics and Political Economy at the University of Texas at Dallas and has consulted for the World Bank, UNIDO, International Task Force for Global Public Goods, and the Inter-American Development Bank. His past books include Global Collective Action, The Political Economy of Terrorism (with Walter Enders), Global Challenges, The Theory of Externalities, Public Goods, and Club Goods (with Richard Cornes), and Transnational Cooperation: An Issue-Based Approach (with Clint Peinhardt).